The non-stop Bible reading marathon starts off at 10am on Wednesday, the 26th of December, 2018 and will continue night and day till the entire Bible is read from Genesis to Revelations. You can go to www.shekinah.org and register your time slot in advance and pick a time that is convenient to you. You can register multiple slots. Each time slot is 15 minutes. You can use your own personal Bible and read in a language of your choice. The New Year's Eve event starts at 10pm on Monday, the 31st of December, 2018. 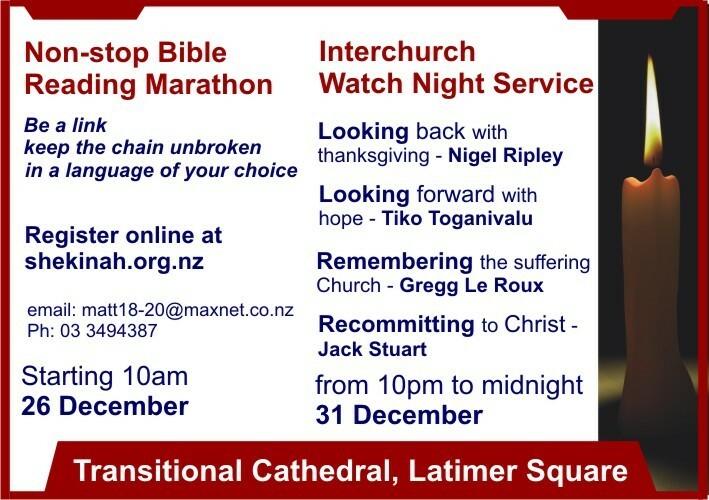 Programme includes inspiring music and powerful messages by Ps Jack Stuart, Ps Nigel Ripley, Ps Tiko Toganivalu and Ps Gregg Le Roux. Refreshments follow. Both events are at the Transitional Cathedral, Latimer Square.